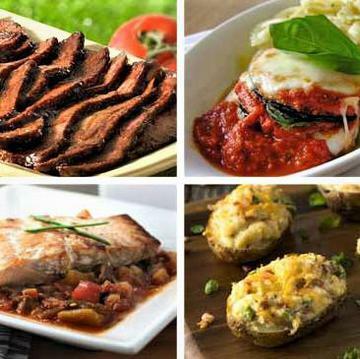 4 meals for two and 2 fabulous desserts mean everyone can have a taste of mom's meals! Because sharing is what moms do best. Prepare from THAWED state for best results. Product may be kept refrigerated up to 3 days prior to use. Individual appliance cooking times will vary. Adjust cooking time accordingly. Conventional Oven: Preheat oven to 350�F. Remove plastic packaging from paper tray. Cover paper tray with foil. Heat for 15-20 min or until warm. Remove foil and heat 5 mins longer or until lightly browned. Carefully place on a plate and serve. Prepare from THAWED state for best results.To thaw product, remove from freezer on the morning of the day of use. Product may be refrigerated up to 3 days prior to use. Individual appliance cooking times will vary. Adjust cooking time accordingly. Microwave: Remove plastic packaging from paper tray. Place paper tray with rice on a plate in the microwave for heating. Heat for2-3 minutes until warm, stirring periodically to ensure even heating. Carefully place rice onto a plate and serve. Prepare from THAWED state for best results. To thaw product, remove from freezer on the morning of the day of use. Product may be kept refrigerated up to 3 days prior to use. Individual appliance cooking times will vary. Adjust cooking time accordingly. Preheat oven to 350� F.. Remove plastic packaging from paper tray. Cover paper tray with foil and place in oven. Heat for 25-30 mins or until internal temp. of 165 degrees. Let stand for 2 min & carefully place onto a plate and serve. Prepare from THAWED state for best results.To thaw product, remove from freezer on the morning of the day of use. Product may be refrigerated up to 3 days prior to use. Individual appliance cooking times will vary. Adjust cooking time accordingly. Oven: Preheat oven to 350� F. Remove plastic packaging from paper tray. Cover paper tray with tinfoil. Heat for 15-20 minutes or until warm. Carefully place potatoes onto a plate to serve. Prepare from THAWED state for best results. Product may be refrigerated up to 3 days prior to use. Individual appliance cooking time will vary. Adjust cooking time accordingly. Microwave: Do not remove or pierce plastic film. Place tray in microwave. Heat on high for 3� to 4� minutes. Film will expand and form a bubble during heating, then self vent and slowly relax over brisket. Remove from microwave and let rest for 2 minutes. Caution, contents are very hot! �Prepare from THAWED state for best results. To thaw product, remove from freezer on morning of the day of use. Product may be kept refrigerates up to 3 months prior to use. Individual appliance cooking times will vary. Adjust cooking time accordingly. Oven: Preheat oven to 350� F. Remove plastic packaging from paper tray and drain any extra water in the tray. Place in oven and heat for 45-50 minutes or until crispy if desired. Carefully place potatoes on a plate and serve. Prepare from THAWED state for best results.To thaw product, remove from freezer on the morning of the day of use. Product may be refrigerated up to 3 days prior to use. Individual appliance cooking times will vary. Adjust cooking time accordingly. Oven: Preheat oven to 350� F. Remove plastic packaging from paper tray. Cover paper tray with foil. Heat for 15-20 minutes or until warm. Remove foil and heat 5 mins or until lightly browned. Carefully place eggplant onto a plate to serve. Prepare from THAWED state for best results. Product may be refrigerated up to 3 days prior to use. Individual appliance cooking times will vary so adjust accordingly. Oven: Preheat oven to 350� F. Remove plastic packaging from paper tray. Place tray on a cookie sheet and place in oven. Heat for 15-20 minutes or until hot. Carefully place onto a plate and serve. No reheating necessary. Remove plastic packaging from plastic tray. Place cheesecake onto a plate and serve. No reheating necessary. Remove plastic packaging from paper tray. Place lemon loaf onto a plate to serve. Wild Salmon. CAPONATA: Zucchini, Eggplant, Fire Roasted Tomatoes, Onions, Canola Oil, Green Pepper, Black Olives, Red Pepper, Garlic, Basil, Capers, Salt, Black Pepper. Orzo Pasta, White Rice, Onions, Butter, Zucchini, Garlic, White pepper. Russet Potatoes, Whole Milk, Butter, Parsley, Spices. Russet Potatoes, Sour Cream, Cheddar Cheese, Unsalted Butter, Bacon, Milk, Green Onions. Cream Cheese, Part Skim Ricotta Cheese, Sugar, Flour, Whole Eggs, Egg Yolks, Lemon Zest, Cream, Chocolate Cookie Crumbs, Butter, Sour Cream. CONTAINS: WHEAT, EGGS, MILK, SOY. Made in a facility that also processes nuts. Sugar, bleached wheat flour (flour, niacin, reduced iron, thiamin, riboflavin, folic acid), dry egg whites, soybean oil, baking soda, dry egg yolks, food starch modified, salt, nonfat milk solids, lemon extract, lemon juice, natural and nature identical flavor, soy lecithin, xantham gum, wheat starch, corn syrup. CONTAINS wheat, eggs, milk, soy. Made in a facility that also processes nuts.